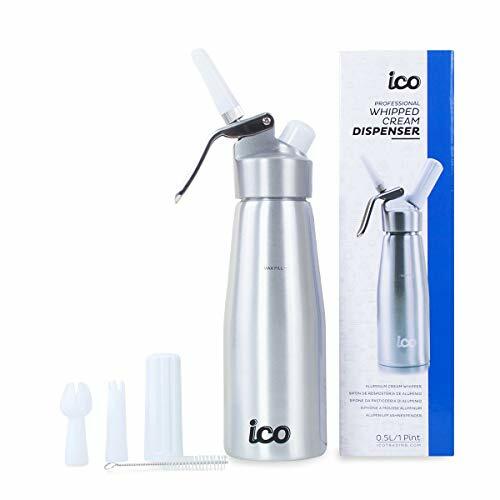 Enjoy fresh, preservative-free whipped cream at home with the ICO Whipped Cream Dispenser! Create quality, preservative-free whipped cream and more Turn 500ml of liquid whipping cream into up to 2L of whipped cream in under 30 seconds! Simply pour your ingredients into your ICO cream whipper, charge with 1 8g N2O charger, and shake it up! Compatible with all brands of cream charger No matter which brand of charger you prefer, you can get whipping with the ICO cream whipper! Our dispenser is compatible with: Whip-It! Cream Chargers Mosa Cream Chargers iSi Cream Chargers Best Whip Cream Chargers Ultra Purewhip Cream Chargers ICO Cream Chargers and many, many more! Not just for dessert Enjoy aerated soups, savoury creams, mousses, and molecular cuisine all made right in your own kitchen. Try one of the newest and most fun culinary trends in years! Top Quality Guaranteed We stand behind all our products and offer a 2-year warranty on this model. ICO Whipped Cream Dispenser is available in the EU, the USA, Canada, Israel, and Central America. A trusted brand for over 15 years. - N2O cartridges are not included with this variation. Select the "Silver with 10 Chargers" variation to purchase this dispenser with 10 whipped cream chargers included. - A trusted European brand with over 15 years experience in bakeware, ICO's is the only whipped cream dispenser that has over 15 years of sales history in Europe, the USA, Canada, Mexico, Central America, and Israel. Trust our product's quality to our experience. Other leading Amazon sellers have only been selling this product since 2015. - Professional quality: ranked by America's Test Kitchen as the best whipped cream dispenser under $30. The only higher rated items were the Mosa Professional ($69.00) and the ISI Gourmet Whip ($99.27). A link to the PDF review is in the description area below. - The only whipped cream dispenser that consistently offers superior value for money. Our prices are lower and our quality is higher than other Amazon sellers and international brands- just read our reviews.